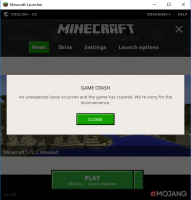 When I try to load my saved worlds from 17w50a the game crashes. Some worlds will load for example my world called 'Velus', but the main world that I have spent a considerable amount of time on 'World Of Rick Riordan' will not load and I get a game crash screen. I have so far tried emptying my inventory & stopping any command blocks from running, as suggested by community members. But this hasn't worked. I have included 2 screenshots and the crash report.